Tomorrow is December 1st, and the corkscrew-fiscal year will be coming to an end in the coming month. And, in recent days, Addicts have been sending emails out to their fellow Addicts with their Best Sixes for 2014. As I have mentioned in the past, it is always a tough choice what will make the best 6 of the year. 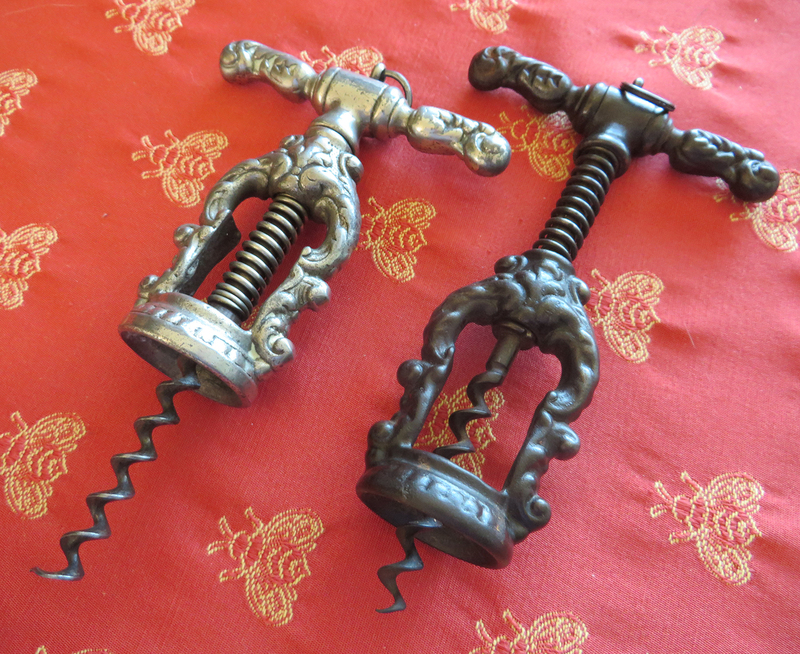 There have been some fantastic corkscrews added to the collection this year. And, there have been many that have come into the collection, only to be traded (or sold) off, and might possibly turn up in other collectors’ best sixes. There are a couple of corkscrews acquired this year that had long been on my wish list, so those will definitely make the cut. But, does the unusual Murphy with blade make the list? It is actually a bit rarer than one might think. And, that is where the decision becomes difficult. Are they the best 6, insofar as they are the most desirable and carry a greater value? Or, are they the best 6, insofar as they carry the most value to the collection; value in appropriateness of fit rather than value in dollars (not that they don’t have that type of value as well). Over the years, I have definitely leaned towards the latter, not that any approach to what makes your personal best 6 is technically wrong. The only true restriction that I place on the decision making process, is that the best 6 of the year was acquired within that corkscrew collecting calendar year. With all that said, here are a few that are in the running. And, of course, you never know what might turn up in the coming weeks. It would be awesome to pick up another rarity that makes the decision that much more difficult (or that much easier for that matter). Just for fun, feel free to weigh in. What do you think should the list? Thanks to Gav who made a youtube video of the Old London Bridge Corkscrew that was auctioned yesterday. 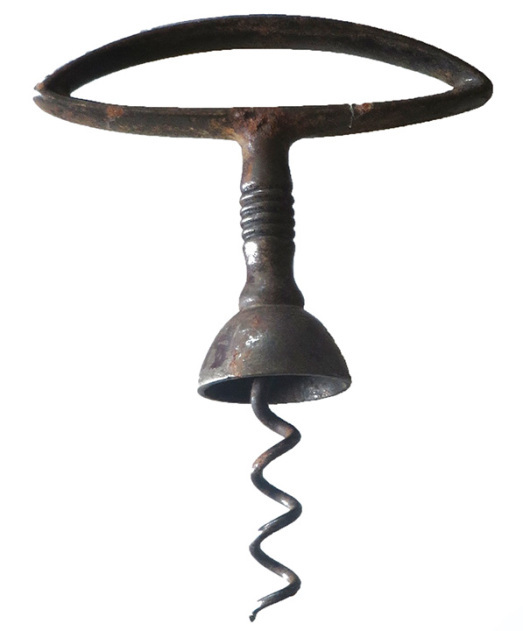 When the dust settled, the rare corkscrew sold for a whopping 40 thousand pounds. Engraved, engraved with the words: “Made from the Iron Shoe that was taken from a pillar. 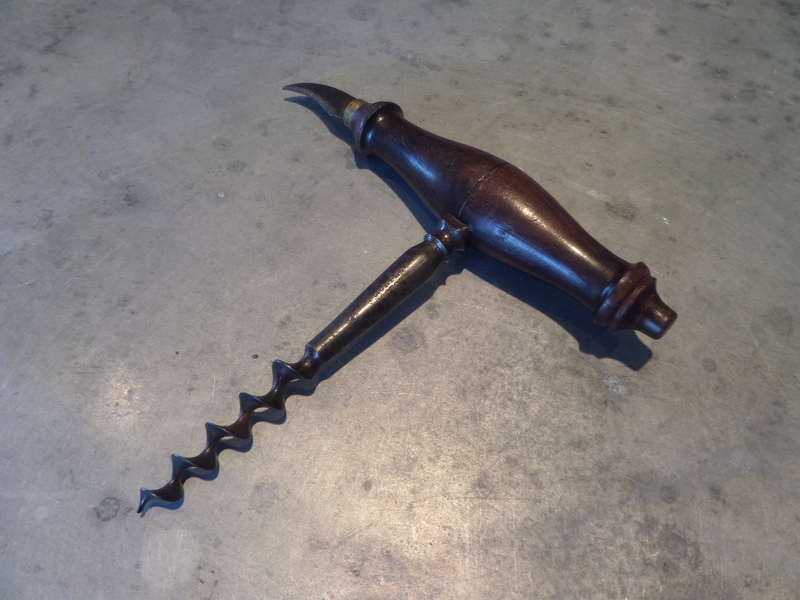 That was 656 Years in the Foundation of Old London Bridge,” this is a remarkable corkscrew, that clearly had some well-heeled collectors breaking the bank for it. “Joseph, Don’t forget that to put this into perspective you need to add a further £8000 auctioneer’s fee and then another £1600 tax on that fee making the total cost to the deep pocketed buyer a whopping £49,600. For those of you that don’t want to do the conversion to U.S. dollars that would be just about $78,100. 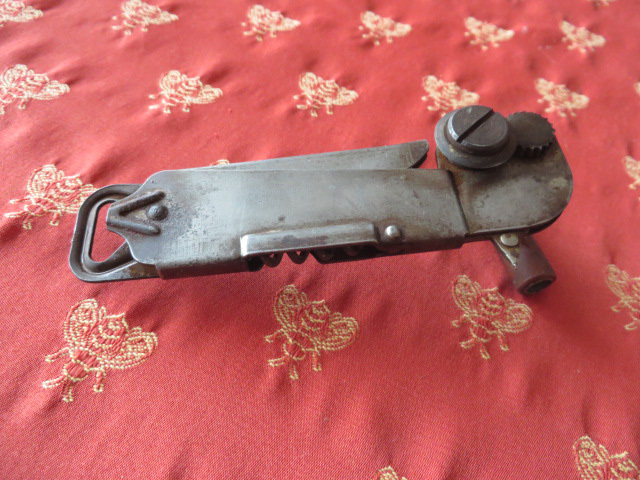 A couple of days ago, I ran across an unusual multi-tool can opener that I had never seen before. 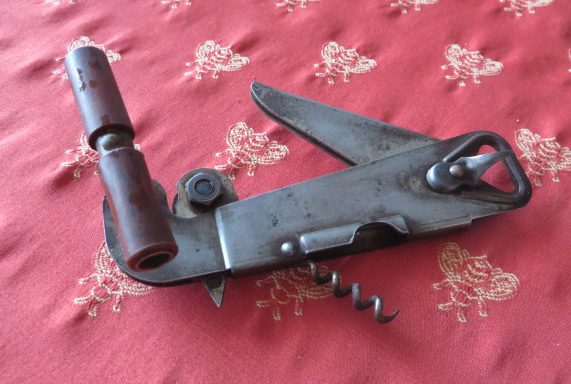 And, as it had a corkscrew attached (and it was on eBay) I snapped it up. The photos were pretty dark, so I brightened them up a bit with photoshop to try and get better idea of what it was. In doing a little research on this one, nothing has yet to come up. If anything does, I will report back here. 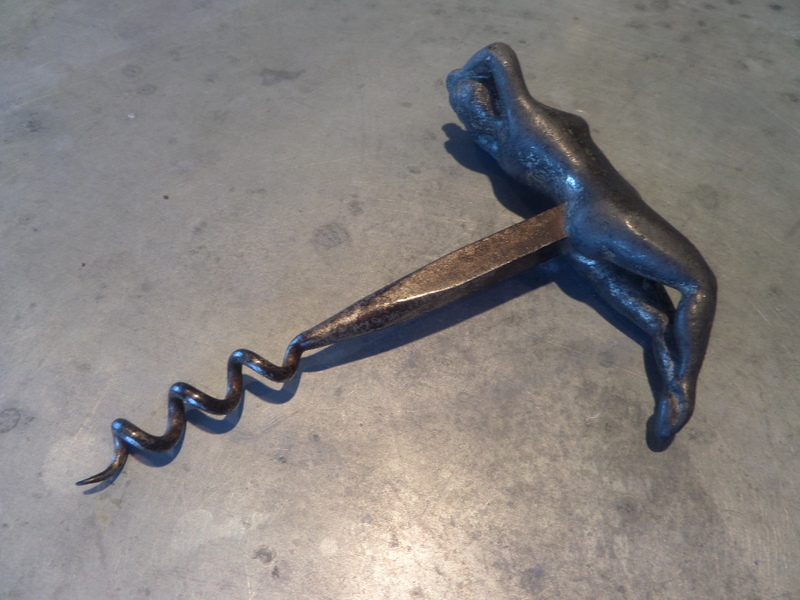 When Ian and Sue were here visiting earlier this year, he gave me an Adelaide corkscrew. 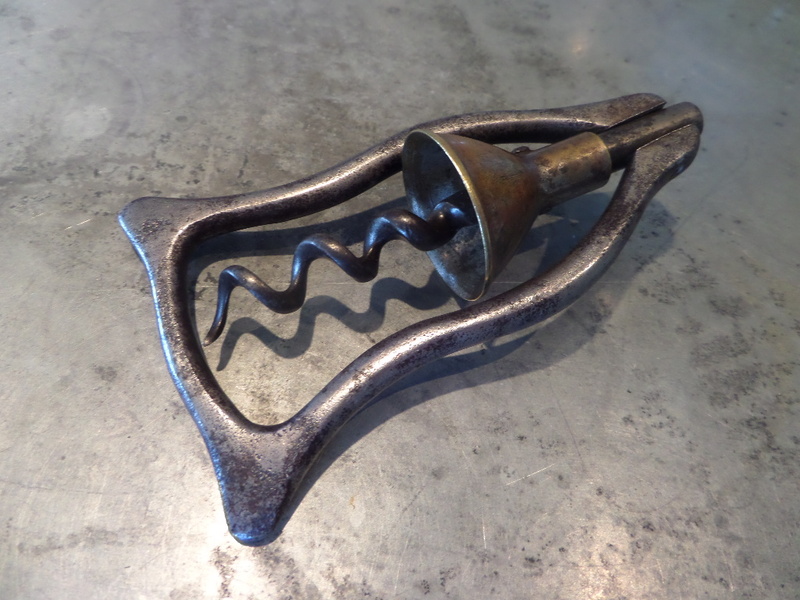 And, that, to this point, is the only Adelaide corkscrew in the collection. Not that I have anything against corkscrew with little spikes on the side, it just is one of those things that hasn’t really come my way. But, since I have one, why not pick up another. 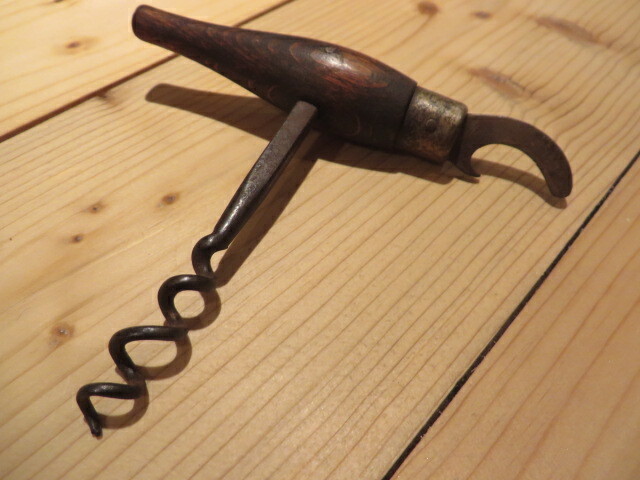 And, a couple of weeks ago,I ran across this corkscrew with an opener-like spiky thing on the side. The corkscrew has taken a while to get here, but I am guessing Ian will know it at first glance–and hopefully fill me in–after which, I will fill all of you in. Yesterday, I hopped in the X-terra, hopped onto the boat, hopped off the boat, hopped into the Mini, and headed for the printer. After retrieving a rather large box, it was back in the Mini and heading south. After a brief stop at Treats (for coffee) I parked the Mini, and unpacked the box of the latest issue of The Bottle Scrue Times, and placed 70 issues into their appropriate pre-addressed envelopes. Taking a chance that there would be a short line at the post office in Wiscasset, Maine, I left the sealed envelopes in the Mini and poked my head into the office. No line, and two clerks! I went back to the Mini, and retrieved the aforementioned issues of the BST. I placed the envelopes on the counter, and the postmistress started printing the postage for each issue heading overseas. Meanwhile, the other clerk grabbed the U.S. bound issues, and started placing stamps on them for me. About midway through the overseas pile, the woman asked what the newsletter was about. I had already explained it was a newsletter for a club, and then mentioned upon her asking, that it was a corkscrew collecting club. I figured that she didn’t have them with her. Still, she promised to email pictures of the corkscrews she did have at home. And, after all of the BST’s were stamped and handed over for delivery, I thanked them for their time. The newsletter is on its way! Thank you helpful Wiscasset post office folk!!! For you ICCA’ers, be sure to check your mailboxes in the days to come! patented by a Canadian. Up in that cold region they probably appreciate this improved device more than we would, as they frequently have cause to open a bottle. In the illustration two views are shown. 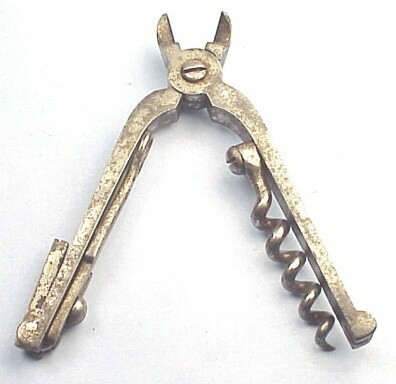 The first a perspective view of the corkscrew before it is screwed into the cork and the other the position as screwed into the cork. 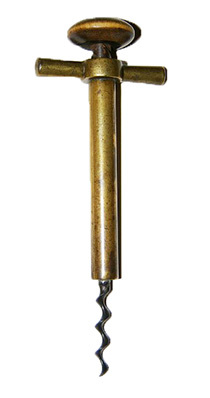 The casing consists of a tubular metal sleeve of any diameter or length, which terminates in a corkscrew point. The sleeve is adapted to rotate around the axis of the threaded shaft, the latter terminating in an ordinary grip handle and connected with the sleeve by a coupling cap. In the center of the cap is a circular opening, through which the shaft passes. Extending down the side of the opening on opposite sides are ribs, adapted to engage in the channels of the shaft. Encircling the coupling cap is a withdrawing handle. 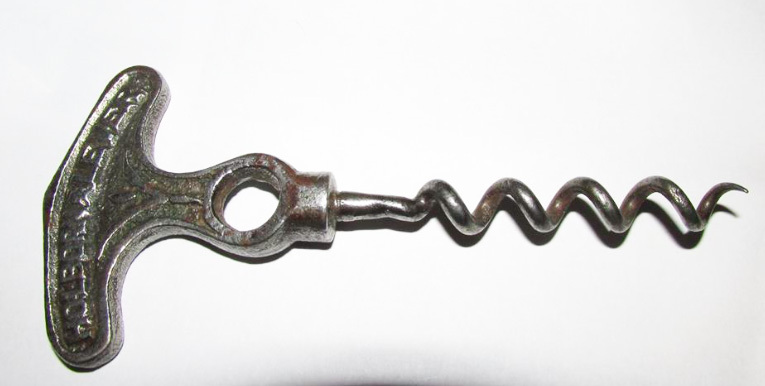 In use the handle of the corkscrew is grasped and the sleeve part held downward, when it will rotate on the shaft. 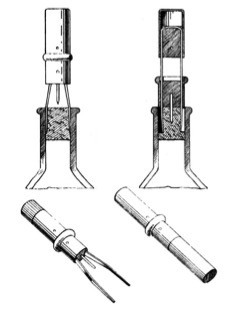 The point is placed in the cork and pressure applied to the handle, which causes the shaft to descend into the sleeve at the same time causing the sleeve to rotate, forcing the corkscrew into the cork. To draw the cork, the handle and the withdrawing handle are taken together, all the pull being necessary on the withdrawing handle. To remove the cork it is only necessary to take hold of the cork and pull upward on the handle. 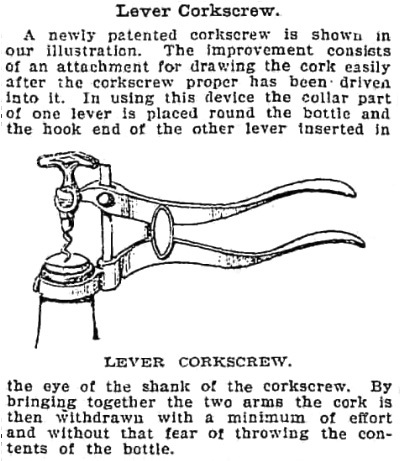 The corkscrew, as described in the article, is the Peter Lymburner Robertson patent of 1905. 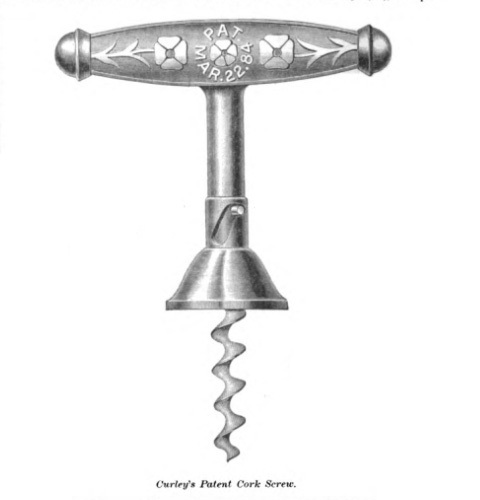 The corkscrew was patented in both Canada and the USA (Canadian patent # 95,620 and US patent # 800,682). We don’t yet have a Robertson in the collection, but would love to add one. 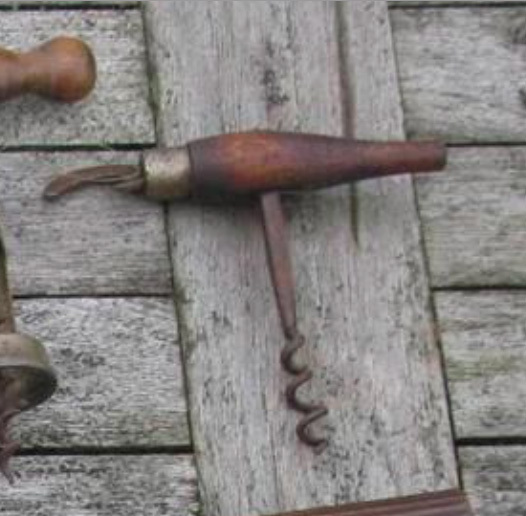 Of course, as we too live in a cold region, and often have cause to open a bottle, if you have any antique corkscrews with which you would like to part, feel free to drop us a line. We will put them to good use. James B. 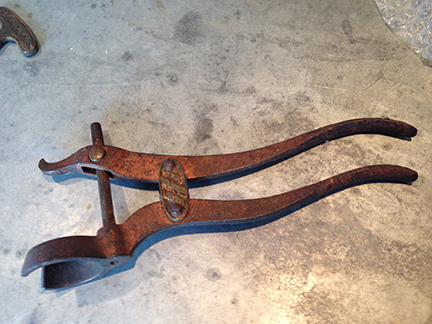 Dodge, Jacksonville, Fla., is placing on the market the “New Era” Cork Extractor, illustrated. The general appearance, when in its case, is indicated by the illustration in the lower right hand corner of the cut. When out of the case it is as shown in the lower left-hand corner. It is made of brass tubing, nickel-plated. 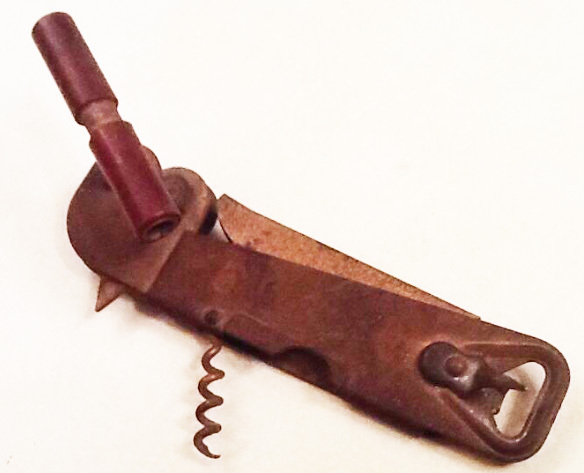 The handle is corrugated so that then twisting on a cork the tool will not slip in the fingers. 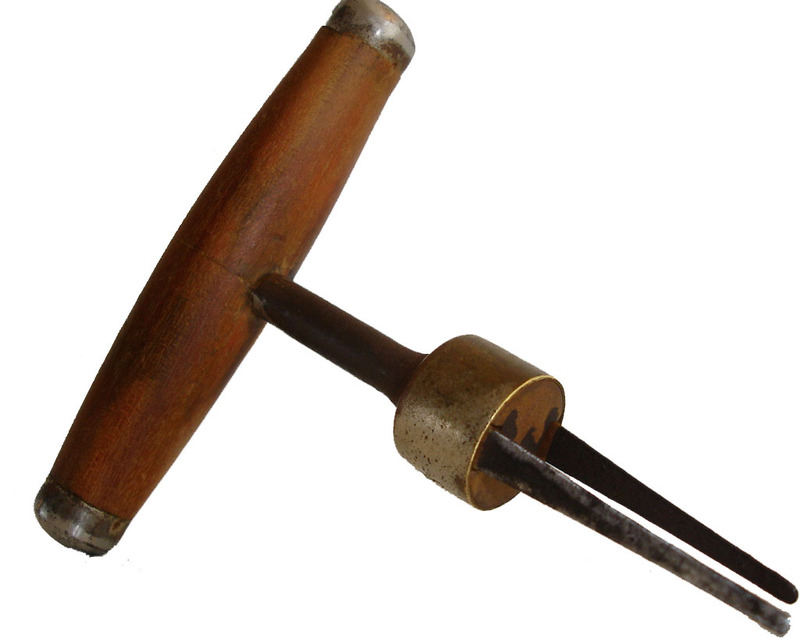 The prongs are firmly held in the handle by means of a wooden plug. In the end of the plug is a spur 7/8 inches long. 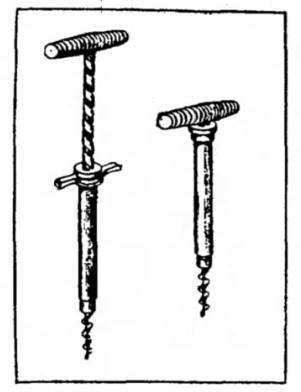 When the prongs are pushed in the neck of a bottle, on each side of a cork, and when they are at the desired depth, push down on the shoulder of clamp until the spur enters the cork at full depth. 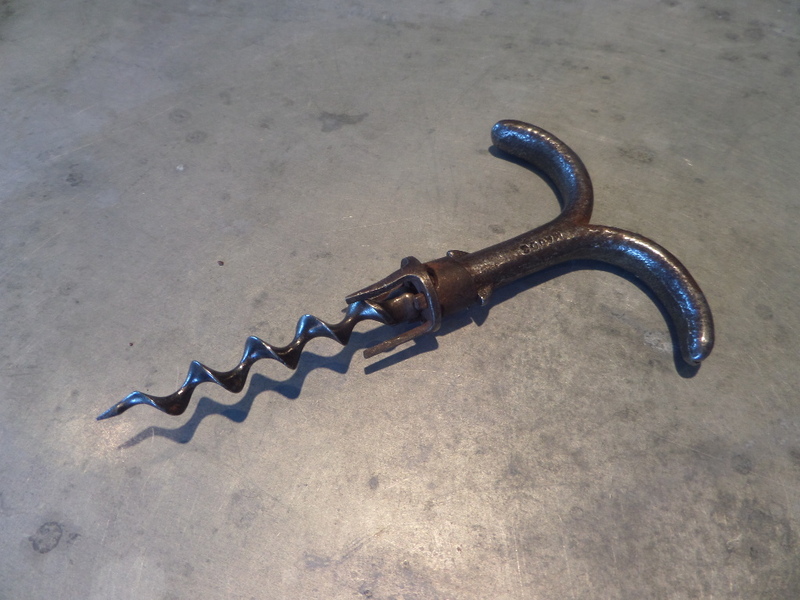 This draws the prongs tightly around the cork and with a twisting motion it is extracted un-injured. 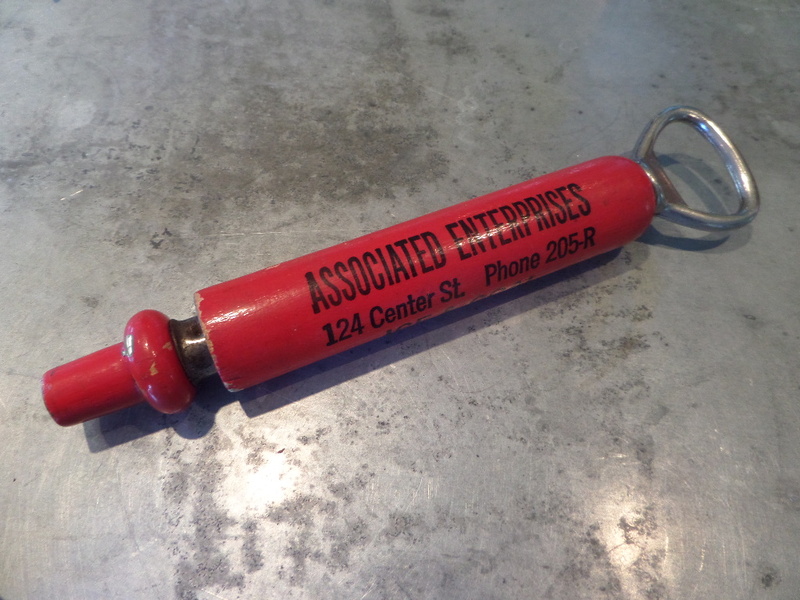 The device when not in use is ½ inch diameter and 5 inches long. Marked on end of the tin case with, PAT. 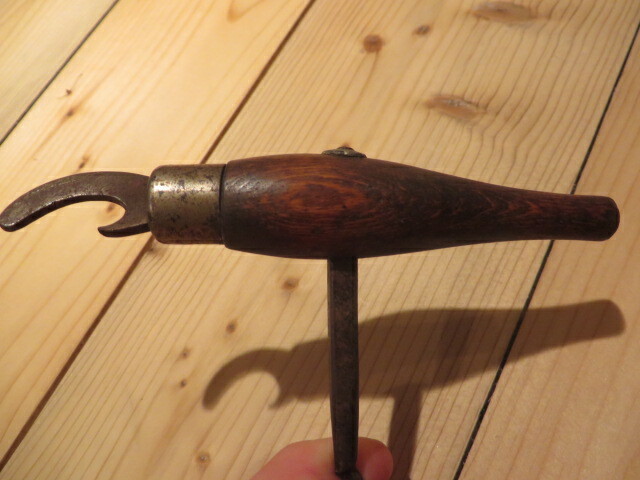 MAY 28-07, this is one cork puller that I have yet to use to open a bottle of wine, I have no doubt it would work, but with the little spike in the middle being held in with a wooden plug, using it sounds a little iffy, or dodgy as it were. I would love to add another to the collection however. Why not have two Dodge patents! Drop me a line if you have one! From The Iron age. v.42 (July-Dec 1888). The article, illustrated above is put on the market by Dame, Stoddard & Kendall, Boston, Mass. It is made entirely of steel. As indicated in the cut, the shank of the screw is given play in the handle, with a construction which is referred to as affording a powerful leverage by which the corkscrew is enabled to do its work with exceptional facility. 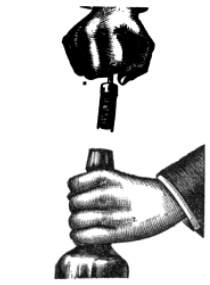 The directions given for the use of this corkscrew are: That the bottle be placed on its base, the screw inserted in the cork in the ordinary way, and when the inside of the bell strikes the top of the bottle, the corkscrew is still kept turning, being slightly pulled at the same time, and in this manner it is claimed that the most obstinate corks can be twisted out with ease. 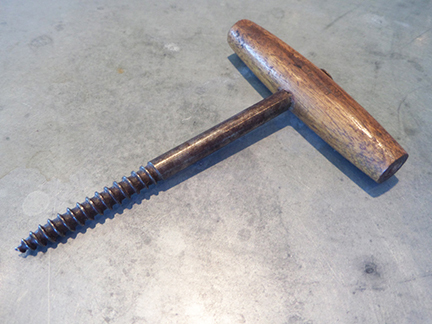 The screw is so adjusted in the handle, that when broken, a new one can be easily substituted. And, soon to be added to the Curley Corkscrew page. Not too long ago, I picked up a Holborn Lever without the corkscrew. It arrived a while back, and since I bought it, I have been trying to find an appropriate screw to go with the lever. Today a deal was struck, and a Holborn corkscrew is headed to the island. Soon enough it will be reunited with the Holborn lever. Now I am pretty doubtful that they actually were an original pairing, still it is nice to have a set. The professional joker has launched many a quip and quibble at the gentleman attempting to extract a refractory cork. The “magic” cork extractor shown herewith is to change all this. By its aid the cork is to be gently but none the less effectually extracted. The cork will also retain its shape and usefulness and not have the hollow chested and despondent air noticeable in corks which have suffered from frequent attacks with an old-fashioned corkscrew. How it will work in practice we have had no opportunity of demonstrating it; but theoretically, at least, it appears to be a valuable invention.